State-supported public research university with 45-acre campus in Newark. Origins date to 1884 founding of Newark Technical School, later became Newark College of Engineering in 1930, adopted current name effective 1975. Offers 50 undergraduate (Bachelor of Science/Arts) majors and 78 graduate (Masters and PhD) programs in six specialized schools in in engineering, architecture, computer science, management and related science and technological disciplines, also sponsors extensive extensive Continuing Professional Education and online programs. Ranks #1 of NJ public universities and #3 in state overall based on post-graduation earnings 10 years after enrollment with median salary of $64,500, according to US Department of Education College Scorecard. Ranked #106 of all National Universities, #69 of Best Colleges for Veterans by 2019 edition of Best Colleges, US News & World Report; #92 of Best Public Colleges, #140 of Research Universities in 2019 America's Top Colleges, Forbes. About half of students major in engineering or engineering technologies; 20% in computer/information technology; 12% architecture. 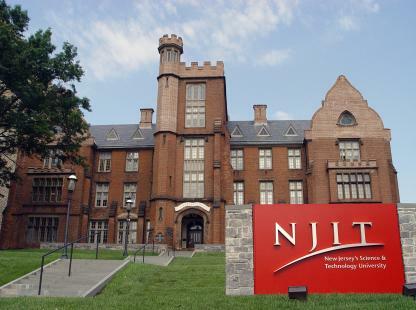 2002 proposal by task force of Governor McGreevey recommended merger of NJIT and then University of Medicine & Dentistry into Rutgers University, opposition blocked introduction in Legislature. School of Architecture among 10 largest in US, only public school of architecture in NJ, first in nation to offer computer-assisted design courses. Albert Dorman Honors College-first honors college in NJ-provides learning environment with scholarship incentives for some 400 of brightest and best prepared students. Research initiatives include manufacturing, microelectronics, transportation, computer science, environmental science, and architecture and building science. Enterprise Development Center tech and life sciences business incubator on campus helps startups and growth companies by providing work space and attracting investment capital. President Joel Bloom appointed 2012, previously NJIT vice president, dean of Honors College, prior senior positions with NJ Department of Education, began career as teacher and school administrator in NY City Public Schools.